The Eurozone, the US, Japan and the UK are all suffering prolonged economic stagnation. [You can see how serious it is in the US here.] It is sensible to suggest that they are doing something (or perhaps many things) wrong and need to change policy. What is not sensible is ignoring a developed world economy that has conspicuously not suffered any of the economic stagnation problems that have hit the major developed economies. Indeed, has not had a recession (in the sense of two quarters of economic contraction) since 1991. That sailed through the Great Recession and Global Financial Crisis (aka GFC) with barely a ripple. Whose current problems are not of economic stagnation but of maintaining economic balance when one part of the economy is doing much better than another. That country is Australia. Yes, it is true that the surge in commodity demand (centred on China) has been a boon to the Australian economy (well, to the commodity exporting States; the resultant surge in the value of the $A has been a problem for the tourism-and-goods exporting States—the commodity boom has been a distinctly mixed blessing). But Australia had also managed to avoid recession even when its terms of trade (the ratio of the price of what it sells to the price of what it buys) were in long-term decline and when commodity prices dropped dramatically at the onset of the Great Recession. Indeed, the fall in Australia’s exports as a % of GDP was worse than the US’s. Yet the Australian success gets mostly ignored. A classic example is Raghuram Rajan’s recent piece in Foreign Affairs. (Non-gated version here [pdf].) Much of what he has to say about the desirability for supply-side reforms is sensible. Indeed, much of what he advocates Australia has already done; which makes the failure to mention what should be the poster-polity for what he is advocating all the more of a glaring failure. today’s economic troubles are not simply the result of inadequate demand but the result, equally, of a distorted supply side. For decades before the financial crisis in 2008, advanced economies were losing their ability to grow by making useful things. But they needed to somehow replace the jobs that had been lost to technology and foreign competition and to pay for the pensions and health care of their aging populations. So in an effort to pump up growth, governments spent more than they could afford and promoted easy credit to get households to do the same. The growth that these countries engineered, with its dependence on borrowing, proved unsustainable. Does anyone really think Australia just magically averted such structural problems, that its economy is somehow profoundly different from other developed countries? 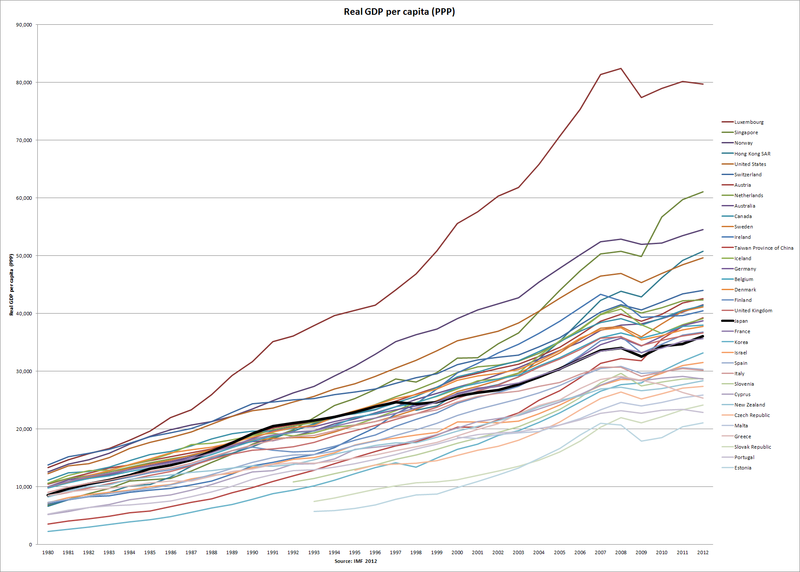 Given its per capita GDP growth has been respectable but not outstanding. In particular, while its public finances were much sounder, with public debt reduced to very low levels, enthusiastic embrace of private debt meant that the total level of indebtedness was and is comparable to other developed countries. the common thread was that debt-fueled growth was unsustainable. Except, apparently, in Australia. Australia ran a mildly higher inflation rate than the US during the “Great Moderation”, so its monetary policy was more “lax” than “easy money-easy credit” US. Rajan is claiming that low interest rates are an “easy credit” policy: but credit is a supply-and-demand process. Yes, low interest rates make credit cheap to buy but it also reduces the return on providing it. Something is missing in this story; that a lot of capital was looking for safe havens. Many developing economies might be vigorously growing, but they have also been significantly failing to satisfy the demand for safer assets. Said demand therefore flowed into developed countries: including Australia, which continues to run the substantial current account deficits it has for 50 years (i.e. be a net importer of capital). So, the “too much debt/easy credit” story of sin Rajan (and others) want to tell just does not work if you include Australia. It is true that Australian financial institutions were not much affected by the GFC and that Australian housing prices have not crashed (yet). The former is, in part, because of superior prudential regulation. This includes the Australian banking trade-off where the “four pillars” (NAB, Westpac, ANZ, CBA) have some level of protection in return for strong prudential oversight. Conversely, the American banking sector is far more fragmented, due to regulatory blocks on inter-state branching. Comparison with the performance of both the Canadian and the Australian banking sectors suggests that this regulated fragmentation has not been a social positive. (The much-discussed separation of investment and deposit banking is much less important.) But the GFC does not explain the Great Recession. On the contrary, a failure of monetary policy both aggravated the GFC and created the Great Recession; as was also true for the Great Depression [pdf]. So, despite “lax” monetary policy, fairly standard levels of indebtedness and a considerable export shock, Australian demand (and so income) did not collapse. Which meant debt remained manageable. Why? The RBA is also an example of the Australian ability to “do” bureaucracy. It has a clear policy focus, set out in a public letter of agreement between the Governor and the Treasurer, and a strong organisational identity that extends to deliberately investing in developing the skills and experience of its staff. If income collapses, debt becomes much harder to manage. If your income does not collapse, you are much less likely to have a debt-management problem. Yes, lots of developed countries are having debt-management problems. But that is not because they were strikingly more indebted than Australia (even if their public debt levels are higher). It is because spending, and so income, did collapse. The way out of the crisis cannot be still more borrowing and spending, especially if the spending does not build lasting assets that will help future generations pay off the debts that they will be saddled with. Someone’s future liabilities are also someone else’s future income (which is why debt defaults worry folk so; yes, it eliminates someone’s liabilities but it also eliminates someone else’s assets: this also increases your risk premium for any future borrowing). But, leaving that aside, there can be spending without borrowing: that is the joy of monetary stimulus. Yes, the fiscal multiplier is a measure of central bank incompetence. Yes, the monetary authority “moves last”. But, if it is competent, it chooses to move in ways that do not create catastrophic collapses in spending and so income. If people have more confidence in their future income prospects, they will spend. And, if they spend, income goes up and debt becomes much more manageable. Yes, it would be a good idea if developed countries reformed their public sectors, if they abolished regulations that protect incumbents and retard economic activity, if they got their debt levels under control. All things Australia has done (but, in some areas—notably its land use permit rajs—not enough). But neither the Great Recession nor the Global Financial Crisis would have been anywhere near as severe if the US, the UK and the Eurozone had had central banks as competent and accountable as the RBA. If they now became as competent and accountable as the RBA, economic recovery would occur much quicker and unemployment would fall much faster. The alleviation of utterly unnecessary human misery would be worth it all on its own. And structural reform could be sold as providing benefits, not simply sharing pain. Pain that, moreover, will not get folk spending again: for that, you have to change their expectations in positive ways. Which central banks can do more thoroughly, and far more cheaply, than anyone else. All it takes is to be as competent, and as accountable, as the RBA. It is very, very necessary that folk start using the A-word, and considering the example it provides, a lot more. This entry was written by Lorenzo, posted on at 9:45 am, filed under Australia, Britain, Economics, Public Policy and tagged australia, central banking, Debt, GFC, Great Moderation, Great Recession, money, national debt, public debt, RBA. Bookmark the permalink. Follow any comments here with the RSS feed for this post. Post a comment or leave a trackback: Trackback URL. [email protected], I did appreciate my questions were not directed to monetary policy, however I think it needs to be accepted that whatever policy alternatives are pursued, they will exist within and must have regard to the prevailing institutional and regulatory framework. Elegant theory eventually has to deal with gritty reality for it to be of any relevance. That said, thanks for acknowledging and addressing my points; your comments are interesting. [email protected] If you want to take interest rates as the price of renting money, that’s ok. But it is not the price of money. Just as the price of renting a house is not the price of a house and the price of renting a cow is not the price of a cow. [email protected] No, I meant borrowing the cow (remember, I was giving an example of credit in a barter economy). If you borrowed the cow and gave it back intact but otherwise paid nothing, that would be like borrowing money with no interest (as friends and family do lots). If you borrowed the cow but agreed to pay a chicken each week you held on to the cow, the weekly chicken would be the interest rate on cow borrowing. So, if you want to think of interest rates as the price of renting money, sure. [email protected] But if most of what you brought up had nothing to do with monetary policy (and it didn’t) then it had nothing to do with monetary policy. So it is fine to discuss monetary policy in terms of only stuff that is actually relevant to monetary policy. Something is missing in this story; that a lot of capital was looking for safe havens. Australian financial institutions were not much affected by the GFC [….] in part, because of superior prudential regulation. Australian banking trade-off where the “four pillars” have some level of protection in return for strong prudential oversight. The RBA is also an example of the Australian ability to “do” bureaucracy. … if the US, the UK and the Eurozone had had central banks as competent and accountable as the RBA. All comments I agree with, and part of ‘the A-model’ which interests me. But if you now say they are not “actually relevant” to your own interests I will politely withdraw. [email protected] As i said, these are comparative, not absolute judgements. Are our institutions perfect? Of course not. Are there potential problems? Yes. But if the BoJ, Fed,ECB and BoE were as competent and accountable, and well-targeted as the RBA would things be much better? Yes. Yes – I believe so. And I’m sorry about the bold – it looks like shouting which was not my intent; should have used italics I guess. Who said anything about looser credit? I know folk talk about monetary policy in terms of interest rates, but there is more to monetary policy than interest rates. When I hear that from people like Scott Sumner, they’re usually suggesting the Fed needs to tell people to expect more inflation so that it will become a self-fulfilling prophecy, but I doubt you’re suggesting that the Fed won’t be able to create inflation expectations if it fears fiscal policy might cause inflation. So seriously, has any central bank ever successfully stimulated the economy without dropping rates? Interest rates are higher in Australia than the US. Could that be part of why the RBC has been more successful in managing the crisis? I see the RBC did lower rates during the recession, and in fact rates haven’t returned to pre-recession levels. Also, there is reason to believe that interest rates are in long-term decline, particularly in the US, since it has remained such a preferred safe haven for capital from the developing world (which is getting more prosperous, so producing more savings and thus more capital). Just because there’s a reason for it doesn’t mean it is inevitable. If congress pursued a long term strategy of more fiscal stimulus, the Fed would meet their inflation targets by raising rates. So whatever is driving rates down, if we want rates to vary around the rates we had in the 90s (as I think we should), fiscal expansion could make that happen, whereas the Fed could not make it happen. I would not hold the Fed solely responsible. I would not hold them at all responsible. We haven’t had inflation problems, so they shouldn’t have at any point tried to push them higher. Yes, the monetary authority moves last. So, the US gets as much stimulus as the Fed is happy with. Assuming the Fed can provide as much as it wants. In that case, yes, fiscal policy just determines what interest rate we have during the stimulus, and during the boom determines whether credit is efficiently allocated to subprime mortgages or inefficiently allocated to rebuilding public infrastructure. [email protected] I suspect we are mostly in furious agreement. So seriously, has any central bank ever successfully stimulated the economy without dropping rates? Real or nominal? Part of the point of creating inflation expectations at the zero bound is to push real interest rates lower. Yes, that the RBA has never wandered near the zero bound does make managing monetary policy easier. But part of the effect of the way the RBA manages monetary policy is that it was much less risk of running into the zero bound. whereas the Fed could not make it happen. Yes it could. If it told people it would do whatever it took to get NGDP growth to 5%, that would be stimulatory. Part of what makes the RBA different is that it manages income expectations as well as inflation expectations. is efficiently allocated to subprime mortgages or inefficiently allocated to rebuilding public infrastructure. Interesting article Lorenzo, which would seem to reinforce your own view as to the competency of the RBA, but also that the board members can sometimes be influenced by self interest, or at least the interests of their constituencies. kvd, I think you’re seeing the Tammany Hall phenomenon — namely, people will tolerate a lot of self-dealing corruption *as long as the important functions of government get done*. The moment they fail to get stuff done — as when the Tweed Courthouse managed to have so much graft that the graft used up all the money and the courthouse wasn’t actually finished — THEN it became possible to break Tammany Hall.